This second installment of the California labor history series is excerpted from the newly released book, From Mission to Microchip: A History of the California Labor Movement by California Federation of Teachers Communications Director Fred Glass. What does it take to change the course of history? Awareness of the potential to change it, at the very least. At the peak of unionization in the 1950s, more than 40% of California’s non-farm workforce belonged to unions. The volunteer activism of union members in the mid twentieth century lifted the working class majority up into the middle class of homeownership and disposable income. Today, with union density at its lowest point in nearly a century, two million Californians still carry union cards, but only representing 16%. California labor history doesn’t begin and end with union membership. Unions are but one part of a broader saga, repeated countless times—in coastal seaports, Central Valley farms, southern oilfields and Sierra foothills, in corporate high rises and bungalow classrooms—of workers’ journeys from isolation and powerlessness to community, strength and hope. The toolbox of that story contains unions, to be sure; but also legislation, election campaigns, legal battles, community murals, songs, demonstrations, and a mountain of dedication by ordinary people to shared ideas of fairness and social justice. Some union activists became famous, like farm worker Cesar Chavez and longshoreman Harry Bridges. Most remain unknown, like Anna Smith, the widow of a disabled Civil War veteran, and single mother, who migrated to the state in 1875. She spoke at demonstrations called by the Workingmen’s Party of California in the late 1870s, and led several hundred workers—who had elected her their “general”—on a march intending to join ‘Coxey’s Army’ in Washington, D.C. protesting against the horrendous economic depression of the early 1890s. Also all but unknown today are events like the 1934 San Francisco General Strike, where a struggle by dock workers and sailors against terrible wages and unfair and oppressive hiring practices escalated due to violent employer resistance. Following police killings of strikers, and a massive response by unions that shut down the city for several days, the maritime workers achieved union recognition, a fair contract, and a hiring hall that shared the available work equally. Beyond these advances, the General Strike contributed to sentiments in the United States Congress that led to passage of the National Labor Relations Act a year later. In its wake, millions joined unions in California and across the country. For many people, especially immigrants, the unions they joined in the 1930s provided their first access to participation in democratic institutions, economic security, and home ownership. After World War II, California changed in important ways. So did the ways workers approached solving their problems. In place of direct workplace action, workers more often concentrated on political and legislative activities. The 1958 statewide election campaign pitted a coalition of labor federations and civil rights groups against the gubernatorial ambition of a wealthy newspaper owner from Oakland, U.S. Senator William Knowland, who bankrolled an anti-union “Right to Work” initiative on the same ballot. 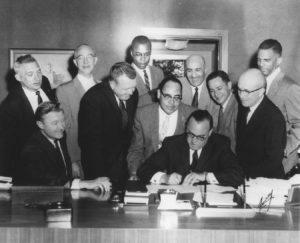 Governor Pat Brown signs the Fair Employment Practices Act in April 1959 with labor and civil rights leaders from the coalition that organized to make the legislation happen. The import of these events is indisputable. Where, then, do we find this labor history of the Golden State? Why are these events, and the accomplishments of people like Anna Smith, missing from films, television programs, textbooks, and from the awareness of most people in California? Most people have become aware that the decline of union power over the past several decades has paralleled the decline of median income. Less well known is the decline in California homeownership rates, down from its peak of 61% to 54% today. The continued shrinkage of unions has also meant dimming awareness of labor’s historic role in elevating workers into the middle class. The majority of the population has always been and will continue to be working people. This means that most history is labor history. A critical mass of people sharing this insight is essential to change history’s course. Read more about California’s fight to unionize in From Mission to Microchip: A History of the California Labor Movement, by Fred Glass, and published by the University of California Press.